In this short video, Richard Heinberg explores why The Great Burning — the combustion of oil, coal, and natural gas — must come to an end during the next few decades. If the twentieth century was all about increasing our burn rate year after blazing year, the dominant trend of twenty-first century will be a gradual flame-out. This video is the second in a four-part series by Richard Heinberg and Post Carbon Institute. The themes covered in these videos are much more thoroughly explored in Heinberg’s latest book, Afterburn: Society Beyond Fossil Fuels. The Economist, a periodical around since the early days of the British empire (1843), the latter now defunct because of the unfortunate maneuvering of the British elite in 1939 (is Scotland still part of the empire? Wales? ), has great trouble to farewell the oil age. Which is understandable since the exploitation of oil was an essential precondition for the emergence of the British empire in the first place, or the post-1945 American empire for that matter. No oil, no Anglosphere, at least not as a global hegemon. Although the Economist does not exactly buy into the myth of Saudi America, it prematurely assumes that the whole idea of peak oil can be dismissed and that the ‘peak-oil brigade looks out of date‘. 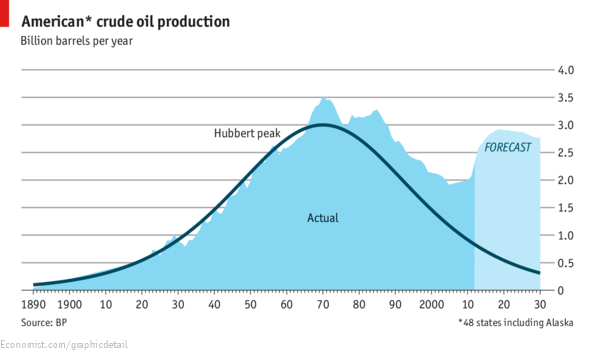 Looking at the graph, even the Economist assumes that under the new (unrealistic) assumptions US oil production will peak in 2020. That’s merely 7 years away. But as Slate and many others have shown, the shale oil boom will be very short-lived and could peak as early as 2015-2016. It is true that the shale business will delay execution of industrial society with a few more years, but business as usual is over for good and that reality at the pump will kick in real soon, long before 2020. The Economist is in deep denial. Published jan 2, 2013. Youtube text: Robert L. Hirsch is a former senior energy program adviser for Science Applications International Corporation and is a Senior Energy Advisor at MISI and a consultant in energy, technology, and management. His primary experience is in research, development, and commercial applications. He has managed technology programs in oil and natural gas exploration and petroleum refining, synthetic fuels, fusion, fission, renewables, defense technologies, chemical analysis, and basic research. Nate Hagens, former President of Sanctuary Asset Management and a Vice President at the investment firms Salomon Brothers and Lehman Brothers turned global resource depletion Nostradamus, discusses the prospects for growth. The spike around 1980 was brought down again with nuclear energy and oil discoveries in the North Sea and Mexico. Now it is rising again, as a consequence of peak conventional oil. It remains to be seen if the shale oil/gas development can change much. Aucott uses the phase shift ice –> water –> vapor as a model to understand what is happening in the world of oil prices. From the graph it becomes apparent that something happened in 2005, namely the vanishing of oil price elasticity and abrupt increase of oil prices. Aucott suggests that we are witnessing a phase shift in the economic system. It is time that economists, who know all about water, should start to interest themselves in vapor. Well, at least Michael Kumhof, deputy chief of the modeling division at the research department of the International Monetary Fund (IMF). Last month we already reported that the IMF had acknowledged that she at least understood what the word meant, now one of their employees takes the concept seriously, without wholeheartedly embracing it, yet. Kumhof is looking into the matter for ten years now and still has difficulty deciding whether the world has arrived on a liquid fuel production plateau or not and if, but it is certain that crude oil production is stable since 2005, without being certain whether this is due to geological or financial constraints. Kumhof nevertheless takes the idea of peakoil very serious as he is convinced of the very grave consequences. His models reveal that a continuous decline in production of 2% per year would lead to a price increase of oil of 800% after 20 years. Kumhof is not that convinced of the impact of shale oil. Further he refers to the ‘best peakoil study to date’ [pdf] investigating when the beginning of the production decline is to be expected. After 228 pages the study concludes that we don’t know, but almost certain before 2030 and ‘with a significant probability that it might happen quite a few years before 2030.’ Kumhof admits that his work has not yet arrived at the chef etage of the IMF and no official position has been taken. To sum it up: ignoring the possibility of peakoil would be irresponsible. Well, that’s a start, albeit a bit late. Video by Matt Beer, his site here. Missed by many was the contest in Maryland’s 6th district, where Roscoe Bartlett – the second-oldest (86!) serving member of the US House of Representatives – was denied his bid to serve his district for an 11th term… The change in voter demographics made Bartlett’s campaign an uphill battle… In losing Congressman Bartlett, the U.S. Congress has also lost its “Mr. Peak Oil.”. There have been many titans of public education about Peak Oil and our collective energy challenges–names such as Matt Simmons, Richard Heinberg, Robert Hirsch, and many many more–but only one, Roscoe Bartlett, did it from the floor of the U.S. House of Representatives… His scientific background fueled his understanding of America’s energy challenges and his desire to explain these critical issues to others. And he did just that. In March 2005, armed with a collection of huge charts – around 30 in all., he stood on the House floor to give the first of many lonely speeches. The world has less and less oil to offer, he told the near-empty House chamber. The age of cheap energy is ending, he explained. And if the U.S. did not start adapting, it was in for a shock. 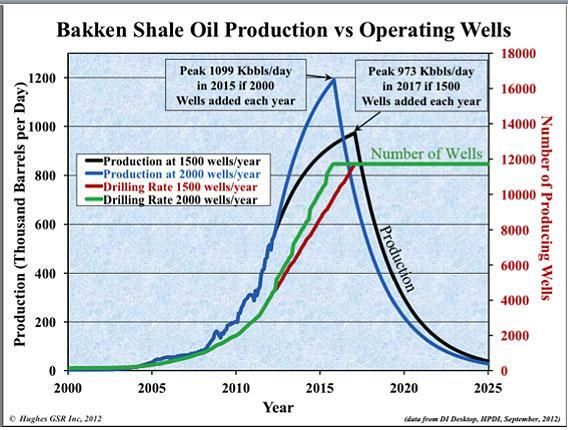 Kjell Aleklett – Peak Oil Postponed? Youtube text: Professor Kjell Aleklett speaks of the Peak Oil phenomenon at a seminar arranged by think tank Global Challenge in Stockholm. Better late than never; more than a decade after the concept of peak oil was minted, the IMF acknowledges that the consequences could be serious for the economy. But since the IMF does not have a crystal ball, its researchers came with a handfull of scenarios for the future, including grim ones. All told, however, the IMF authors say it’s quite possible that a decent-sized decline in oil production could have “dramatic” effects that could prove very, very difficult for the world to adjust to. 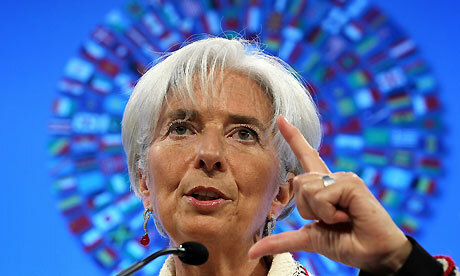 Where would we be without the IMF. Richard Heinberg has dedicated his life to understanding the notion of ‘The End of Economic Growth’, why it is upon us and how humanity should best prepare and recalibrate itself for life in world beyond peak oil. Richard gave this fascinating in-depth public lecture at the University of South Australia while promoting his book ‘The End of Growth’ on September 25th, 2012… In this one hour presentation, Richard Heinberg explains the close link between the resource/environment and the social/economic components of the present disintegration. As a journalist with a keen understanding of science and maths he does it better, more comprehensively and more clearly than most others. While the conventional wisdom is that we must get ‘the economy’ growing again, Heinberg shows that not only is this the wrong strategy, it is actually making the situation worse and more intractable. 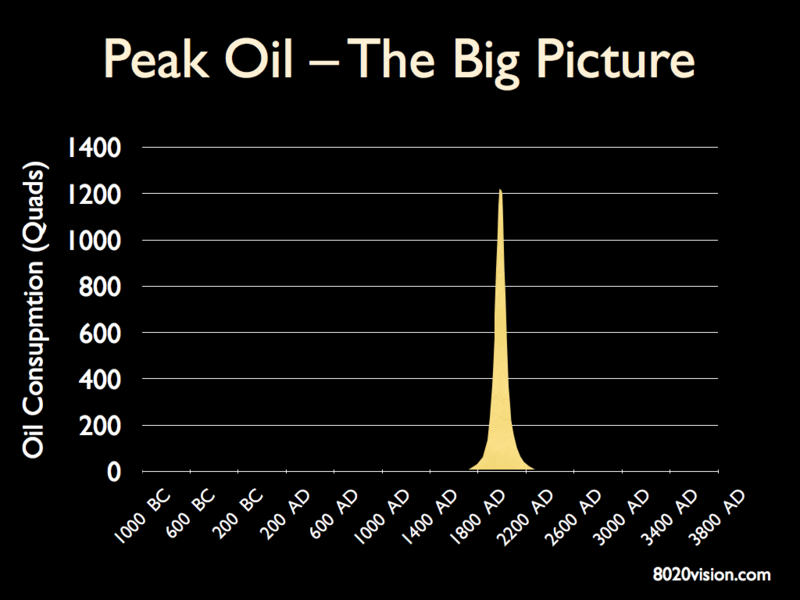 Same peak oil message in different form. A Fast Blast poll (01/12/2006, after this show) found 62% siding with Corsi and 38% with Ruppert. Were do you side today in 2011? Author Jerome Corsi and researcher Michael Rupper debated whether oil is a renewable source produced deep inside the Earth, or a finite resource, which will become scarcer within our lifetime. Corsi’s position: Oil is not “fossil fuel” but rather an “abiotic” substance that is naturally replenished on a constant basis. The so-called scarcity is a tact taken by the oil companies in order to increase their profits. Various surveys going back to the early 1900’s have all claimed that we were going to run out of oil, but we now have a greater supply than we ever had. Oil companies should lose their tax incentives if they don’t increase their reserves. Ruppert’s position: The world is behaving as if the Peak Oil theory were true, and our supplies will begin to dwindle from the amount they are now at. The notion of replenishing abiotic oil is not supported in scientific literature. Further, specific abiotic sites such as Dneiper-Donets basin and the Eugene Island Lot have turned out to be a bust or in decline in terms of supplying oil. People should adjust their lives as if Peak Oil is indeed true, and prepare and plan ahead for that eventuality. Post Carbon Institute Fellow Bill Rees discusses cultural denial and how we could start adapting to our ecological challenges through a new cultural narrative. From the recent International Conference on Degrowth in the Americas.